Summer weather is upon us, which means it’s time for ice cream. 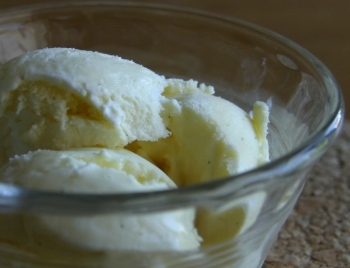 Here is a simple recipe for vanilla ice cream, made with vanilla sugar. Put the cream, milk, vanilla sugar and salt into a sauce pan. Bring to simmer over medium high heat, stirring occasionally. Remove from heat. This was written by sairuh. Posted on Tuesday, June 12, 2007, at 11:03 am. Filed under Food. Tagged ice cream, recipe, vanilla. Bookmark the permalink. Follow comments here with the RSS feed. Post a comment or leave a trackback.